The latest issue of tech. 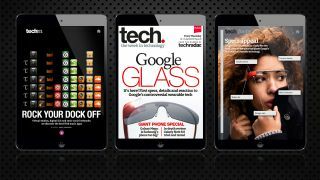 - TechRadar's weekly magazine - is out now for iPad and is packed with the greatest technology around. It takes a close-up look at Google Glass, Google's foray into wearable technology that's shipping to early adopters now. Inside, the magazine reveals the specs' specs and all the reaction from those who have tried the technology. It may have only been announced but Twitter's new music service is also detailed, as well as an analysis into Microsoft's problem with the Start button. To celebrate the launch of Twitter Music tech. also reveals the best music-making apps for your iPad as well as reviewing the biggest phones around - interactive reviews no less. From the Samsung Galaxy Mega to the Asus FonePad, these giant devices are tried and tested by our expert reviews team. And don't forget about the regulars: Week tells you the things you need in your life right now, Video rounds up the best tech footage on the web. Bitcoin is explained in Talk, while the problem with in-app games purchases is this week's big talking point.